The Model 1080FA 85cm motorized Mobile VSAT FlyAway antenna provides video, voice, IP and data communication. It is easily transportable and fully compliant with all major Satellite Provider requirements. AvL's Fly&Drive Mobile VSAT Antenna systems provide versatility for satellite communication users who desire a vehicle-mounted antenna with all the portability of a flyaway mechanism in one antenna system. These systems are packaged into containers that meet air freight requirements allowing the system to be transported anywhere you can fly or drive. Questions? Email an AvL Representative here or call an AvL representative today at +1 828 250 9950. This contact form only accepts English characters. 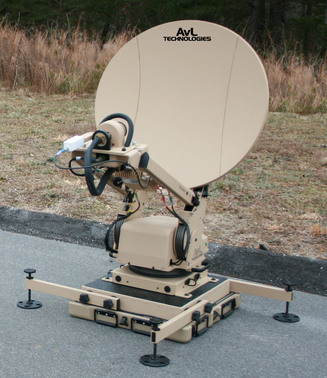 AvL delivers superior mobile satellite communication antenna systems and positioners. AvL's visionary approach to mobile satellite antennas and positioners has established the company as a global leader in innovation and reliability.